"The trauma is just massive. You think of the 50-plus that were killed and the 500 now that are in the hospital and then there were thousands more that were severely impacted." Goulet said one casino called and asked for counselors for employees. Pittman said his church also sent counselors to the Mandalay Bay Resort and Casino at its request. "There's an incredible spirit of Kingdom collaboration," said Vance Pittman, senior pastor at Hope Church, "We're just all in it together." 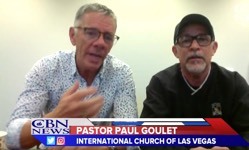 Senior Pastor Paul Marc Goulet of the International Church of Las Vegas said it's been beautiful to see churches responding in unity. "It doesn't matter the denomination whether it's bringing food or going into the hospital everyone's rallying and pulling together," he told CBN News. Goulet and associate pastor Pasqual Urrabazo attended early morning meetings Monday with pastors around the city to plan their response strategy. They're also coordinating their efforts with Las Vegas police and the city council. Area churches have a track-record of partnering with police so the relationships were already in place to coordinate a response after Sunday night's attack, they said. "We're used to working with other churches and with metro police and city council so that's kind of the miracle," said Goulet. Las Vegas churches sent teams of pastors and lay volunteers to meet with shooting victims and their families both in hospitals and at the Thomas and Mack Center where authorities transported many concert-goers after the shooting. Their goal: offer prayer as well as practical needs like snacks and water. Many churches are also providing transportation to concert-goers from out-of-town who missed their flights home. Churches encouraged members to give blood and the results Monday were astounding as blood banks were simply unable to keep up with a crush of donors. Pastor Urrabazo sent CBN News video of the line outside United Blood Services that wrapped around the building twice. By the end of the day, some reported blood banks telling them to come back later in the week. Pastors reported church members waiting in line 2-4 hours. At least two churches, Hope Church and Shadow Hills Church, are working with local blood banks to use their facilities for donations later this week. "The trauma is just massive," said Goulet. "You think of the 50-plus that were killed and the 500 now that are in the hospital and then there were thousands more that were severely impacted." Goulet said one casino called and asked for counselors for employees. Pittman said his church also sent counselors to the Mandalay Bay Resort and Casino at its request. At Shadow Hills Church, Senior Pastor Michael Rochelle said a number of the congregation's college students had attended the Route 91 Harvest country music festival Sunday night. "We know people who lost friends right beside them," said Rochelle. He said working through such major loss and trauma is an unknown journey for him and so many others. "I don't know how you get through this. It's painful," he said. Pittman described Las Vegas as "an incredibly lost city" but said he's encouraged to see how the Lord is working. "A lot of people are asking the question 'where's God in all this?'" he said. Pittman plans to speak directly to the attack in his Sunday sermon to bring a Biblical perspective to the tragedy. "Las Vegas is known as 'Sin City' but where sin abounds grace all the more," he said.